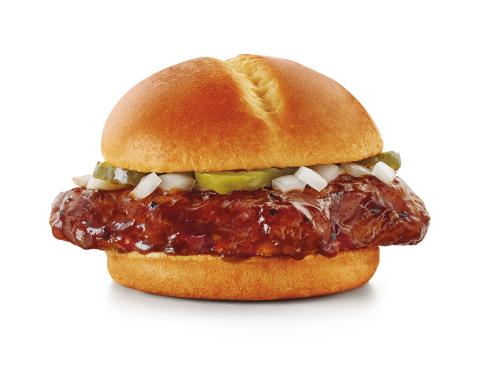 OKLAHOMA CITY, 2017-Jul-27 — /EPR Retail News/ — SONIC® Drive-In (NASDAQ: SONC) is adding to its robust chicken lineup with the introduction of the all-new Dunked Ultimate Chicken Sandwich featuring an innovative blend of bold flavors to a guest favorite. SONIC’s Dunked Ultimate Chicken Sandwich features a flavor-loaded, quality chicken sandwich “dunked” in rich, bold sauce over a premium all-white meat chicken fillet on a warm brioche bun. Slam-dunked in flavor, guests can choose from three premium sauces: Bourbon BBQ, a rich bourbon BBQ sauce with a smoky & sweet linger; Buffalo made with hot and spicy cayenne, red chili peppers and a touch of chipotle; and Garlic Parmesan with Parmesan cheese, roasted garlic and Italian herbs. Pair the new Dunked Ultimate Chicken Sandwich with a side of Tots and a Cherry Limeade and let your taste buds savor the superior chicken sandwich. The Dunked Ultimate Chicken Sandwich will be available only for a limited time so get your hands on one at a drive-in near you before they’re gone. This entry was posted in Business, Food & Beverage, Marketing, Restaurants, Retail, Retailer and tagged Dunked Ultimate Chicken Sandwich, Scott Uehlein, SONIC® Drive-In. Bookmark the permalink.